The building bricks for tomorrow's success are now being laid at the DATEV IT Campus in Nuremberg, Germany. 1,800 employees develop software solutions at the location that facilitate the work of tax consultants, auditors and lawyers. Germany's fourth-largest software company demands maximum performance but offers attractive work conditions at the same time. 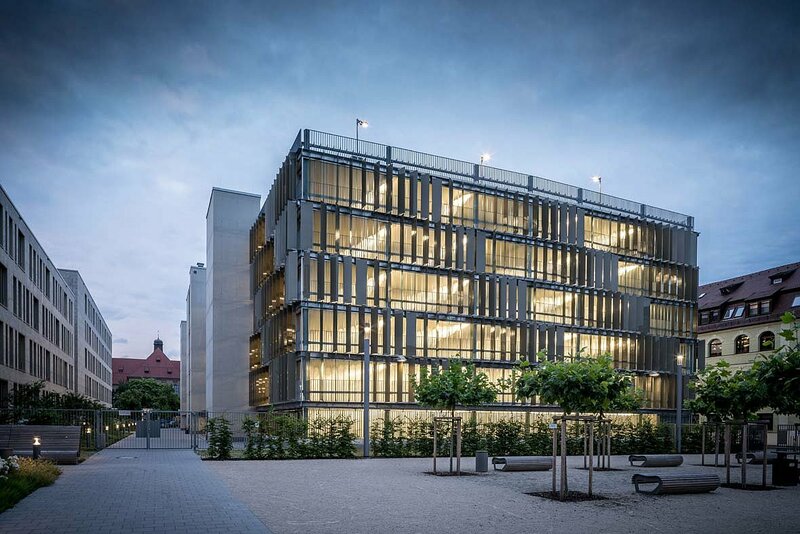 In the new DATEV building located in the Fürther Strasse an environment promoting and supporting creativity and performance has been established, and holistic lighting solutions from TRILUX contribute their part in indoor and outdoor areas. Over 6,000 light points were installed to create a homogeneous lighting infrastructure in accordance with a coherent overall concept. 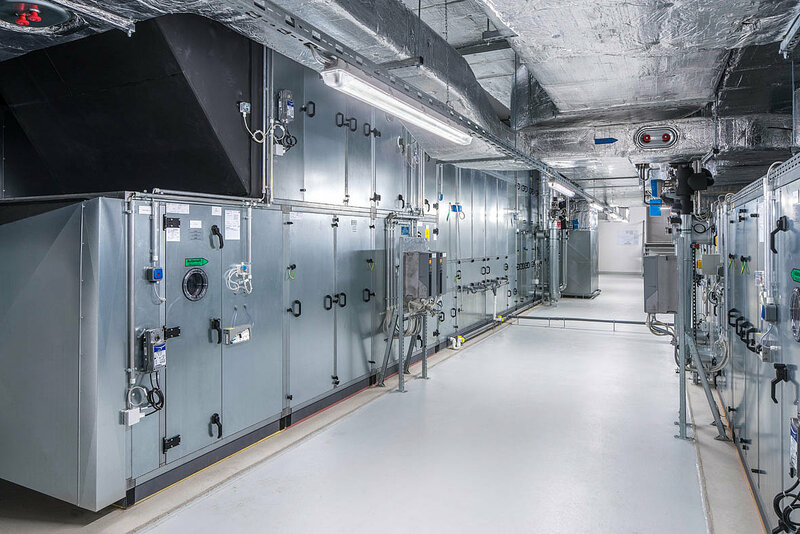 With planning, installation, commissioning and maintenance the complete solution also complies with all requirements regarding energy efficiency, design and light comfort. One factor was clear from the start of the project – the aim was to create a location for well-being and to benefit as much as possible from daylight via efficient lighting. 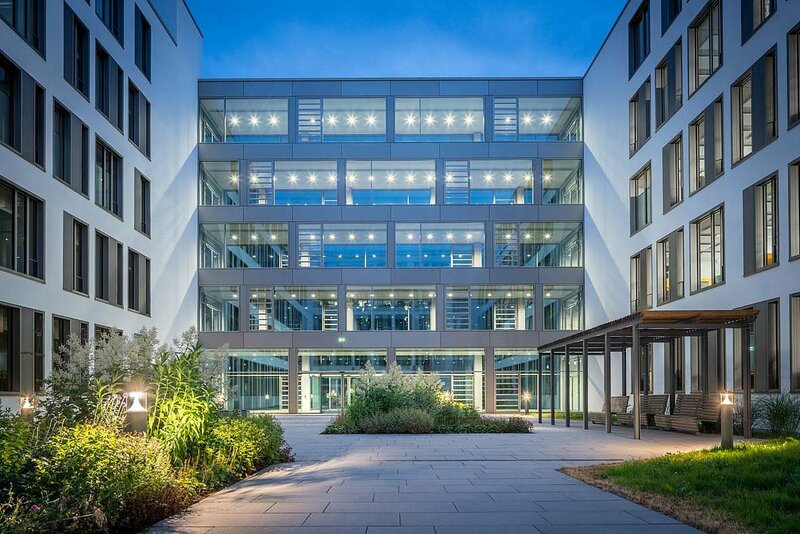 This principle applies to the complete building complex located in the Fürther Strasse, from the garden-like outdoor area and car park to the office building with its four inner courtyards. 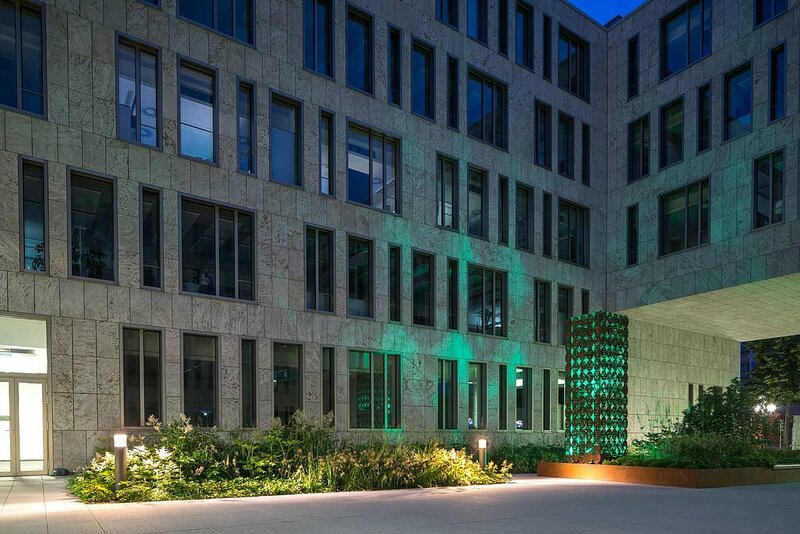 TRILUX as a full-service provider performed in all applications with its wide portfolio of products. 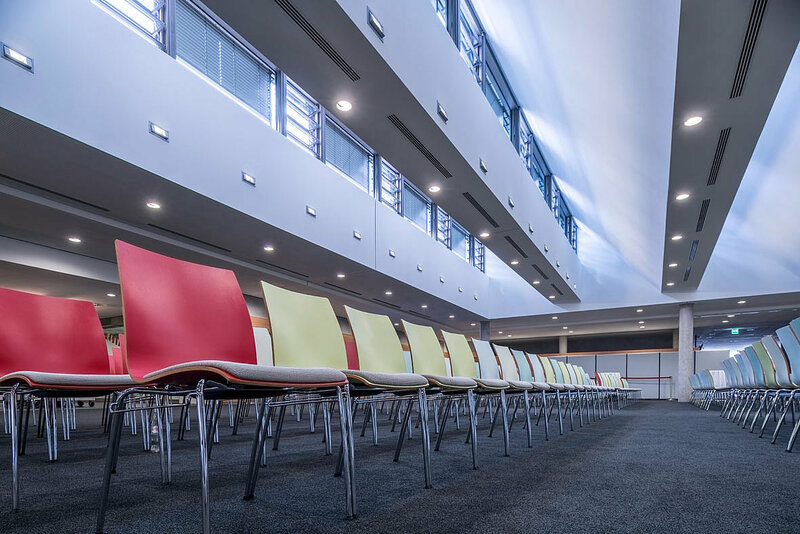 With its holistic range of lighting services, TRILUX demonstrated to the client how simple handling light can be – in accordance with the company's motto: ‘Simplify Your Light’. Inperla luminaires as fascinating elements of design in DATEV's generous entrance area. Wellbeing made easy: Inperla for low-glare light in the relaxation room - the best precondition for pleasant breaks. The complete building complex benefits from a significant amount of natural light thanks to large window areas in the facade as well as a saw-tooth roof design above the restaurant. High daylight levels in turn requires intelligent control of the artificial light, thereby enabling light comfort and energy efficiency to be optimised. This also applies to the systems at the workstations, consistently equipped with presence switching and daylight sensors. 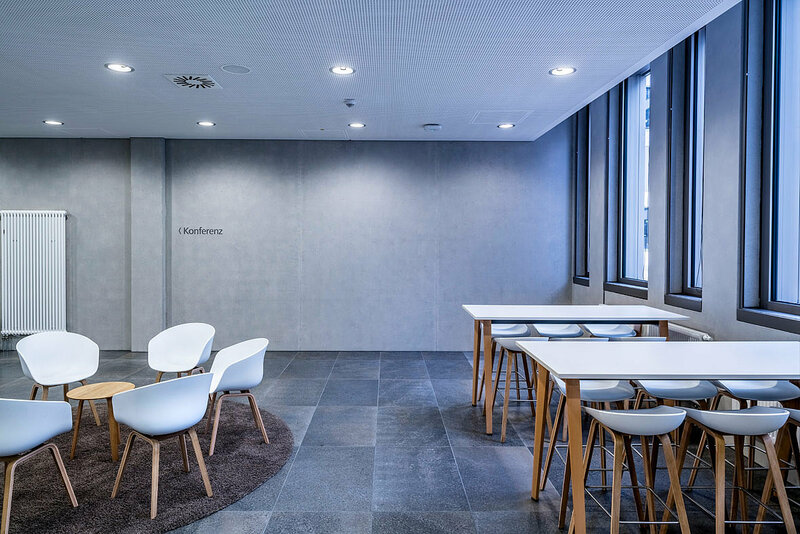 The openly-designed office areas named Open Space with a maximum of 30 workstations benefit from lighting via free-standing luminaires which, with a combination of direct and indirect light, are especially VDU-compliant. 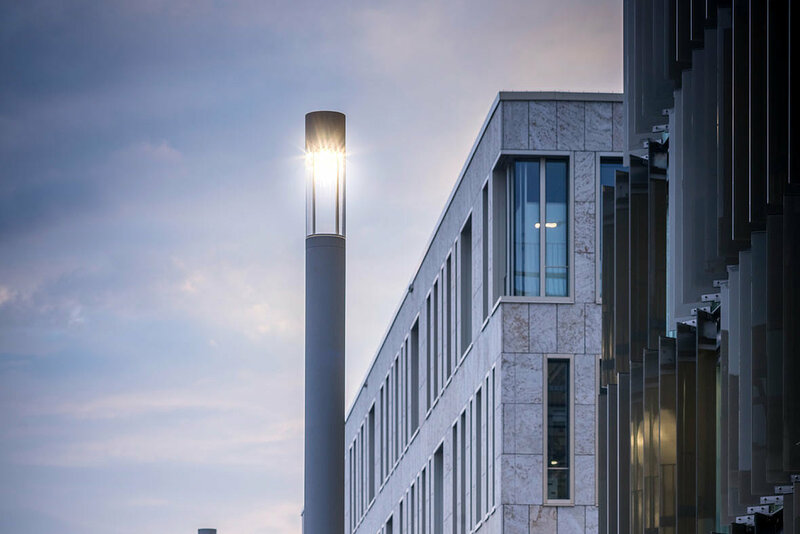 An on-site test with subsequent querying of the employees supplied convincing results – a clear vote for the Offset LED from TRILUX remembers Matthias Greim, responsible for planning and system technology at DATEV. "Offset LED is ideal for computer screen work because it generates absolutely glare-free light thanks to a matt plexiglass insert." The lighting solution creates a positive, motivating light atmosphere and allows for pleasant working conditions. 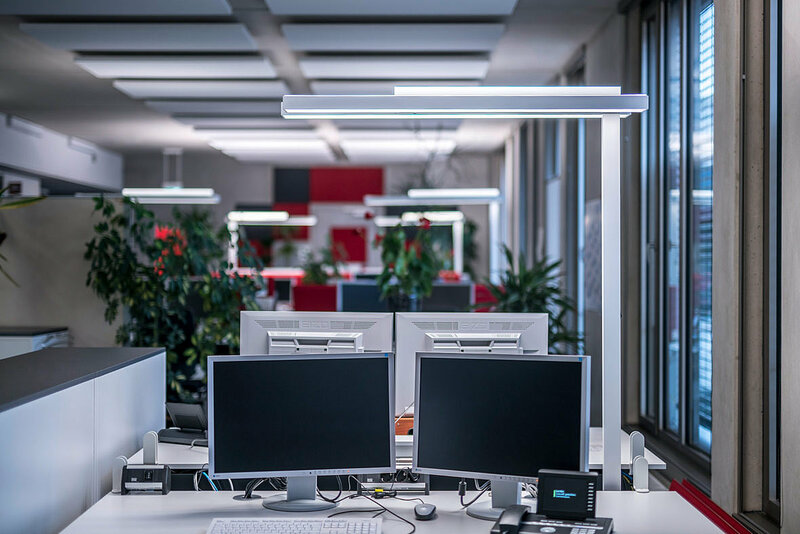 Two workstations and a single free-standing luminaire: despite this each employee has individual control options over their Offset LED. The right light ennobles any architecture. This also applies to the outdoor areas flanked by bollard luminaires. 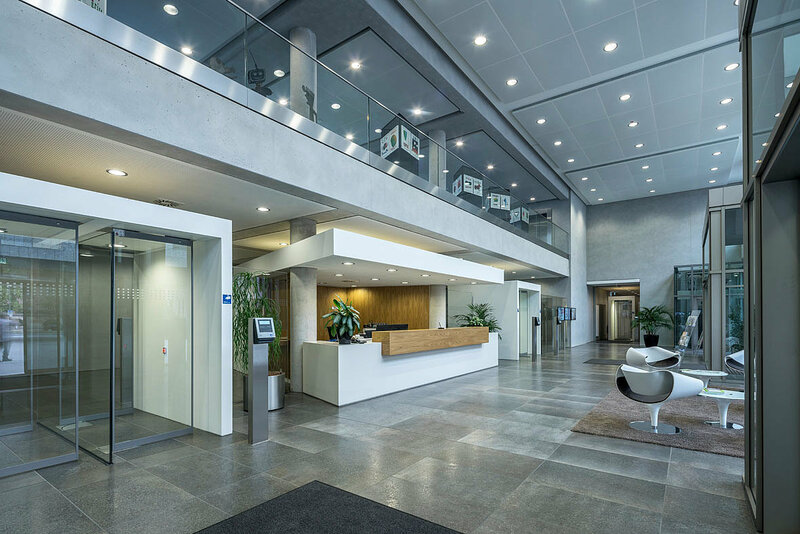 TRILUX also scored points with customised light in the open corridor areas of Open Space where Coriflex LED was installed. 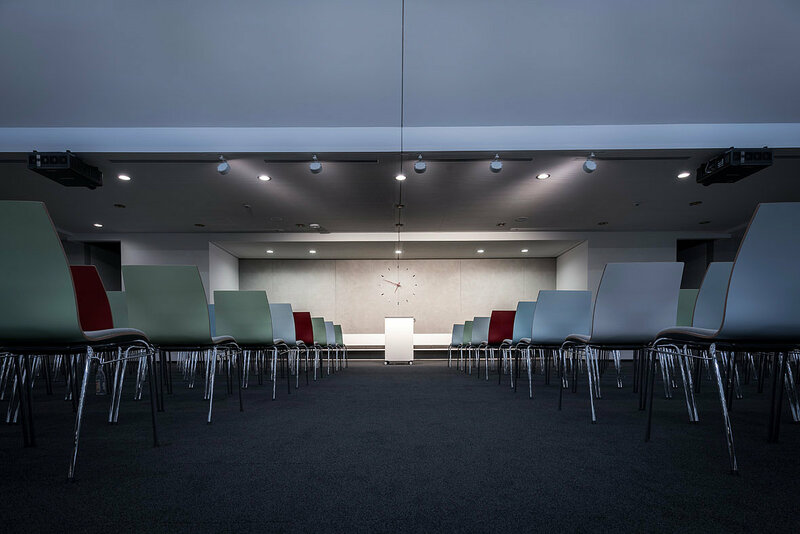 "We needed to change the distribution characteristic to install the luminaires at the outer edge of the ceiling, and this was also in accordance with the architect's design specifications," explained Michaela Pranjic, Head of the TRILUX Competence Centre in Nuremberg. 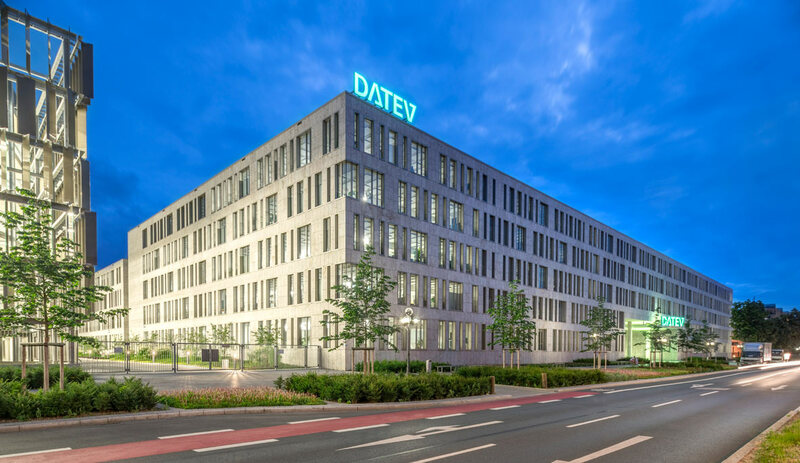 The modern building construction offers its employees even more though: four inner courtyards for work zones and breaks were designed by the DATEV software developers themselves. Employees can retreat into their own oases of wellbeing. In the outdoor areas, the IT campus shows a side where feeling comfortable comes naturally. A green area was created in the form of the DATEV gardens, and the car park with a size of 4,500 m2 can be used by both employees and residents. The area not only provides playing surfaces for boccia and chess but also boasts Nuremberg's longest park bench at 125 metres! The DATEV gardens present themselves in the best light during twilight hours. TRILUX 8841 LED bollard luminaires ensure safety and orientation. The asymmetric distribution characteristic also creates diverse illuminations that continuously fascinate. As a consequence employees always benefit from the very best light – in the mornings while doing VDU work, during relaxing breaks in the inner courtyard and even on the way home through the DATEV gardens to the car park. The advantage for DATEV: with TRILUX as a partner, consulting, planning and complete implementation came from a single source.